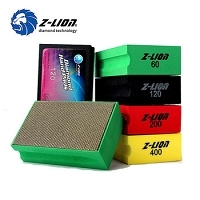 Diamond Hand Pad Set "
Set of 4 Diamond Pads, 60, 120, 200 and 400 grit. Perfect for finishing off the edges of your glass. This product qualifies for free shipping. Only qualified products that total over $ 200.00 will ship free.